Chained Echoes is a classic SNES-styled RPG, bringing back all the fun things from that era while reinventing and developing them further. Follow a group of heroes on their journey through the war-ridden land of Valandis. 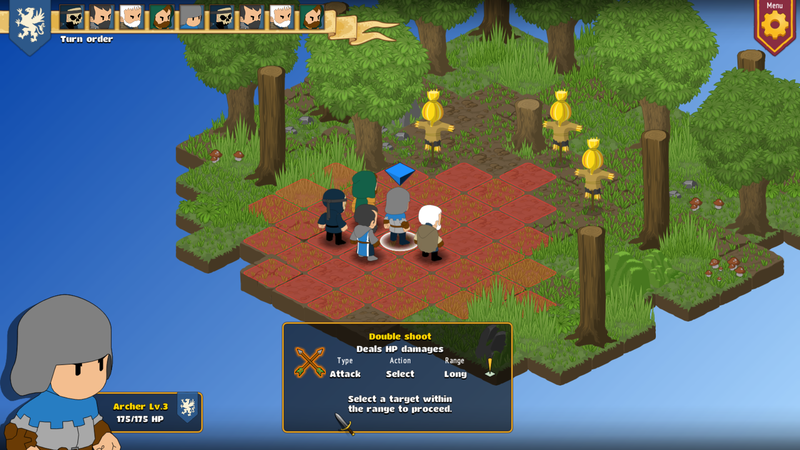 Fight against hordes of enemies in a turn based battle system. There are no random encounters and no separate battle arena. This allows for the player to use the environment to his advantage, either in the midst of the fight or in preparation for it. In case fighting your enemies with sword or magic is not enough, you can switch to your Mech and bring out the big guns. A complex battle and skill system makes sure that everything stays balanced and fun. An equipment system allows for a lot of customization of your characters, your Mechs and even your own airship! And having an airship means that there will be a world map waiting for the players to be explored. Chained Echoes is a colorful adventure full of surprises, fun characters, and an engaging story. "Cohort" is a tactical role playing game taking place in fictive country similar to medieval europe. You must win a series of battles by leading 5 units of your cohort. Each battle allows you to collect or unlock more content and capabilities to increase your chances of victory. Equip your units with ever more efficient equipment, unlock new skills, gain access to new jobs and more. Experience authentic First World War action with 64 player battles of maneuver on the Eastern Front. Warfare between the Russian Empire and the Central Powers is a tense battle for dominance – stay close to your squad to survive! Chained Echoes is like what you get when you incorporate a turn-based combat mechanic to Xenoblade X and put it in SNES. Cohort is something new to me. Interesting. And yeah, finally Verdun gets a sequel. I almost mistook Tannenberg for a DLC. Away: Journey to the Unexpected has a gorgeous art style. I love it! For some reason, its art style reminded me of Akira Toriyama's works, particularly Dragon Quest IX. You can check the game at OGreatGames.com.